Entire books have been written on the rich history of fiddle playing and tunes from Cape Breton Island, and its tradition still continues with robust strength today. Type “Cape Breton fiddling” into YouTube and you’ll get everything from early recordings, to private performances at house parties, from professional contemporary players like Natalie MacMaster and Ashley MacIsaac, to local youths performing, to festival performances, to this 1971 documentary, “The Vanishing Cape Breton Fiddler.” It may have been vanishing in 1971, but by outward appearances it seems it’s being vigorously kept alive, along with accompanying stepdancing. Today, Cape Breton is often considered the international stronghold of true, traditional Scottish fiddling. Folk music from Cape Breton was recorded erratically and only occasionally during the 78 rpm era, until Bernie MacIsaac bought a music store in Antigonish, Nova Scotia, and re-named it the “Celtic Music Store” in 1935. 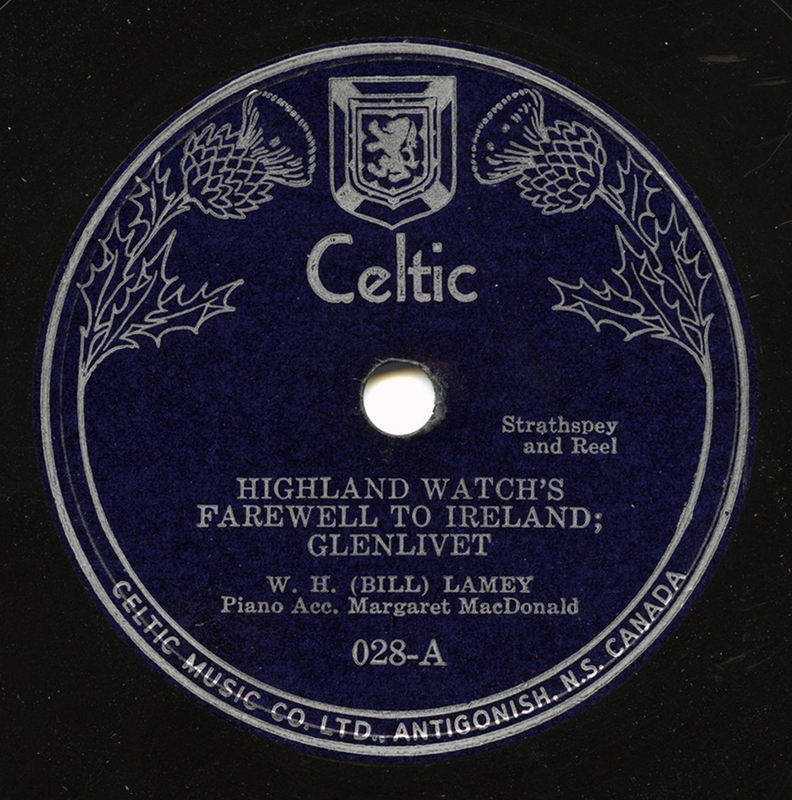 At about the same time, he started an independent record label, also naming it “Celtic,” and got some of the very best fiddlers in the region to record for his local label, namely, Angus Chisholm (who had already recorded for the Decca label), Hugh A. MacDonald, Winston Fitzgerald, Angus Allan Gillis, Dan J. Campbell, and today’s featured fiddle player, William Hugh “Bill” Lamey. The Celtic label is legendary, despite their limited amount of releases, having done a marvelous job doing just what it should have done: serving a relatively small population with well-recorded, excellent performances of local folk music. They helped to preserve the tradition, which later was taken up to a degree by the Rodeo 78 rpm label. Lamey was born on Cape Breton Island in 1914 and first had his own fiddle at the age of 18. While in Sydney, he continued learning from local players and eventually got his own radio show. He recorded at least six 78s beginning around the early 1940s, though his career continued for many years. This side features his long time piano accompanist, Margaret Jessie MacDonald. In 1953, he moved to Boston, and in 1966, perhaps one could say that he helped to usher in a renewed interest in Cape Breton fiddling when he became the first fiddler from the region to perform at the Gaelic Mòd in Inverness, Scotland, where he apparently devastated the crowd with his performance, earning standing ovations. For more, check out this site on Lamey, with information on his releases, as well as Michael Robertson’s Celtic record uploads on YouTube. Wonderful post Jon,the Matrix Number should be CT 7320 in the dead wax? Correct you are – I could barely see it in the light. Fixed. great stuff. Thanks for this one!